Category: Capping & Sealing - Bottles/Jars. With our cutting edge technology, we make linear capping machine for screw capping tightening of pre-threaded caps. The filled bottle along with the cap comes on an in-feed conveyor where the cap is tightened by three pairs of rollers while it is held by the gripping belt. The speed of the conveyor and gripping belt is synchronized and can be varied by AC variable drive. The speed of the roller can be varied by a separate AC variable drive. 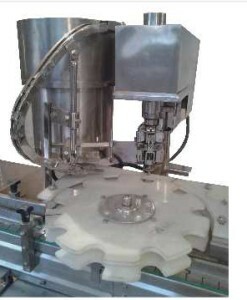 Machine can be provided with the rotary / vibratory feeding system for automatic cap dispensing. This versatile in-line capper handles a wide range of containers at speeds up to 200 bpm and offers a quick and easy changeover that maximizes production flexibility. The tightening discs are gentle which will not damage caps but with a excellent capping performance. 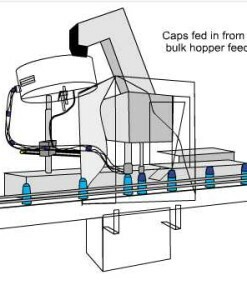 The linear capping machine is applicable to bottles of different specifications (sizes and shapes) with screw caps. It is safe, robust and reliable machine. Bottles enter in line with continuous capping. It is high efficient and quick (capping speed is two or three times as fast as intermittent capping). Feed Conveyor for Cup / Caps. Top Covered with Polycarbonate Sheet. Bottle Jam Detection and Emergency Stop. Rotary Powder Filler Export Order for Ethopia. ICI Pakistan Ordered - Liquid Filling Line for its new plant at Multan Road. Gulf Pharmaceutical UAE Ordered Rotary Powder Filling Machine.